Rose is owner and master seamstres of Rose Mortem clothing. Since 1998, Rose Mortem has created entirely original hand-made romantic gothic clothing for the dark fashion connoisseur. 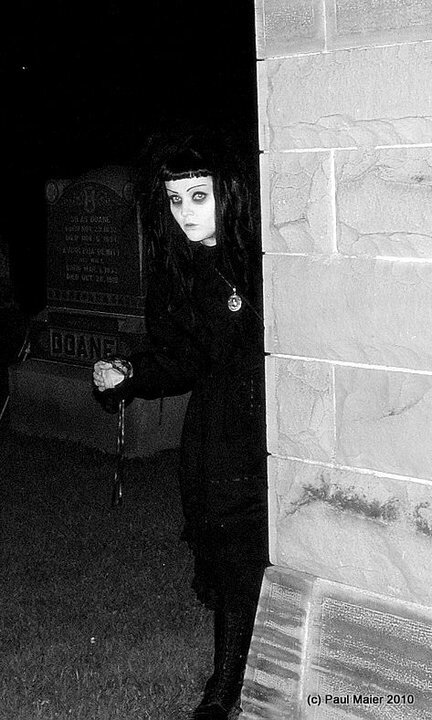 She is also a member of famed South African Goth rock band, The Awakening! Nino, aka DJ Vampire Kiss, is a DJ and promoter from Georgia Tbilisi, half Gregorian half Lithuanian. She has already made her debut in Lithuania, Italy, and Belorusia. Apart from her magic practices in the music industry, VK is a locally well-known model. Apart from this, she has supported and promoted many bands and also worked as a manager for the bands. Suporting lots of fetish and extreme partys with helping on performances, scenography and choreography, she is also a makeup stylist and image maker. She’s been modeling since March 2011 and has enough publications under her belt to be considered a professional. She is fully capable of being her own MUA and hair dresser. She enjoys working with talented people and artists of all trades. Website. Jen is an artist, musician, and part time model. She also runs Strangley Sinister, a handmade oddities boutique. You can also find her on facebook here.